A new George Washington University Battleground poll shows unusually high anti-Washington sentiment after the government shutdown and recent controversies surrounding Obamacare. Republicans in Washington fare worse in the public eye than their Democratic counterparts, though the Tea Party has fallen the furthest. According to the poll, President Obama maintains a 45 percent approval rating, while 52 percent of Americans disapprove of the job he is doing. The public views Congress significantly less favorably, however, with 87 percent of Americans disapproving and only 9 percent bestowing their approval. “We almost are to a point [of] ‘Why even ask the question?’ It’s kind of like searching for African-American votes against Obama,” Republican pollster Ed Goeas, speaking Monday at a Christian Science Monitor Breakfast, joked of Congress’ extremely low standing. Goeas added 50 percent of Americans disapproved of the job their specific member of Congress was doing, 11 points higher than those that approved, and that 58 percent of those polled said they believed it was time to “give a new person a chance.” The latter data point marks the first time in two decades that more than half of voters held that belief. When asked to name the political issues they consider most important, 26 percent of respondents said the “inability of Washington to solve problems,” exactly twice the number that said the economy. Government spending and the deficit was the second most cited issue, at 18 percent. The survey has implications, of course, for the midterm elections, which will take place in exactly one year. Although Democrats maintain a three-point lead in the generic congressional ballot (44 percent to 41 percent), only 26 percent of respondents believe that their member of Congress deserves re-election. Also, though congressional Democrats’ approval ratings are underwater, Republicans are viewed especially unfavorably, with only 27 percent of Americans approving of Republicans in Congress favorably compared to the Democrats’ 41 percent. The number of Americans willing to identify as Tea Partiers has also been cut in half in recent years, according to Goeas. 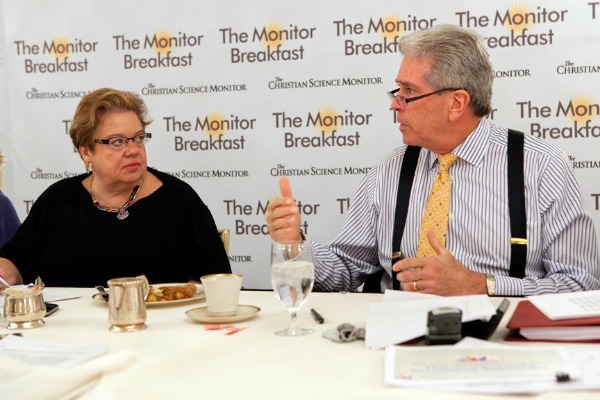 Democratic pollster Celinda Lake told reporters at the breakfast that the polling, when viewed in aggregate, indicates the “potential” for a wave election in 2014. She indicated that one of the biggest challenges for Democrats hoping for just that will be turnout. “If turnout patterns were just average, 34 million voters who voted in 2012 won’t show up in 2014. Two-thirds of those are Democratic voters,” she said, citing previous polling on the question. Goeas and Lake disagreed about the shutdown’s likely impact on the midterms. “In this case, these blame questions are starting to add up to a pretty consistent pattern against the Tea Party and against the Republicans in Congress,” Lake asserted, adding that she does not believe the shutdown’s effect on Republican approval is ephemeral. The survey of 1,000 likely voters was conducted Oct. 27-31 and has a margin of error of plus or minus 3.1 percentage points. Adam O'Neal is a political reporter for RealClearPolitics. He can be reached at aoneal@realclearpolitics.com. Follow him on Twitter @RealClearAdam.